MESA –When it comes to employer sanctions, District 18 Senate Republican Candidate Kevin Gibbons claims that he wants to revisit the issue as part of a “comprehensive plan that deals with all of the different aspects of the issue.” As a national leader in employer sanctions, thanks largely to Senate Candidate Russell Pearce, Arizona has one of the most effective, non-discriminatory laws in the nation. In all, those who have donated to Mr. Gibbons have also contributed nearly $35,000 directly to the “Stop Illegal Hiring Act,” not to mention the ADDITIONAL $38,000 in donations filtered through “Wake Up Arizona” which is made up of the same individuals. Their ballot initiative, if passed, would significantly weaken Arizona’s Employer sanctions laws. Mr. Gibbon’s supporters want to abolish the required use of E-Verify and want to go back to the far riskier and much maligned Federal I-9 process which is full of fraud. E-Verify is 99.7% accurate and is working to help employers hire LEGAL employees easily in conforming to Arizona State Law. Gibbons would be mistaken to attempt to discontinue the use of E-Verify. My wife has been a Human Resource Professional for 21 years and uses E-Verify and attests to it’s effectiveness in hiring a legal workforce. Returning to the old system would require Arizona to wait until the Federal Government has taken action against an employer before the State is allowed to take action. That would be unmistakably a step in the wrong direction. What’s more, their plan eliminates the use of anonymous tips to help catch people who are hiring people illegally! If anonymous tips are good enough to report other crimes they should be good enough for hiring those who are suspected of being in the country illegally. Gutting Arizona’s employer sanctions law is not something that the constituents of District 18 or the citizens of Arizona will stand for. 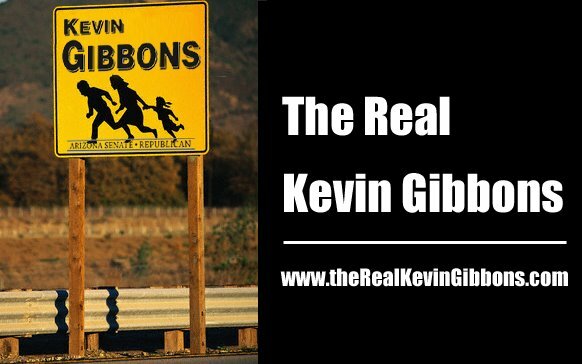 Apparently Kevin Gibbons doesn’t want to revisit the law, he wants to gut it on behalf of the “cheap labor” donors who are bankrolling is campaign. The people of District 18 deserve better than someone masquerading as a Republican who has a workable, tough policy on illegal immigration enforcement and hiring.